The usual form of stairs can be classified into two types: (1) those spanning horizontally in the transverse direction, and (2) those spanning longitudinally. Stairs of this type may be supported on both sides or they may be cantilevered from a supporting wall. Figure 8.17 shows a stair supported on one side by a wall and on the other by a stringer beam. Each step is usually designed as having a breadth b and an effective depth of d = D/2 as shown in the ligurc: a more rigorous analysis of the section is rarely justified. Distribution steel in the longitudinal direction is placed above the main reinforcement. Details of a cantilever stair are shown in figure 8.18. The effective depth of the member is taken as the mean effective depth of the section and the main reinforcement must be placed in the lop of the stairs and anchored into the support. A light mesh of reinforcement is placed in the bottom face to resist shrinkage cracking. 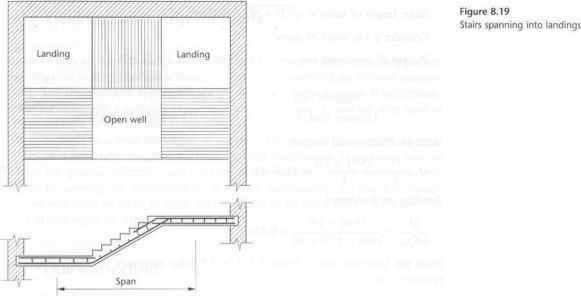 The stair slab may span into landings which span at right angles to the stairs as in figure 8.19 or it may span between supporting beams as in figure 8.20 of example 8.10. The permanent load is calculated along the slope length of the stairs but the variable load is based on the plan area. Loads common on two spans which intersect at light angles and surround an open well may be assumed to be divided equally between the spans. The effective span (/) is measured horizontally between the centres of the supports and the thickness of the waist (h) is taken as the slab thickness. Stair slabs which are continuous and constructed monolithically with their supporting slabs or beams can be designed for a bending moment of say Fl/10. where F is the total ultimate load. However, in many instances the stairs are precast or constructed after the main structure, pockets with dowels being left in the supporting beams to receive the stairs, and with no appreciable end restraint the design moment should be Fl/8. The stairs are of the type shown in figure 8.20 spanning longitudinally and set into pockets in the two supporting beams. The effective span is 3 m and the rise of the stairs is 1.5 m with 260mm treads and 150 mm risers. The variable load is 3.0 kN/nv and the characteristic material strengths are /ck 30N/mnr and/>* = 500N/mnr. Try a 140 mm thick waist, effective depth. <1 115 mm. This would give an initial estimate of the span-effective depth ratio of 26.1 (3000/115) which, from table 6.10. lies a little above the basic value for a 'lightly stressed' simply supported slab. What is the depth of stair slab? What is a waist on a stair? What is the waist on a staircase? What is the span to depth ratio of a concrete stair case? HOW THICK SHOULD A SUSPENDED CONCRETE STAIR WAIST BE? What is a continuous slab stair? How much thickness of staire slab? What should be the thickness of waistslab concrete staircase.? What is thw span/depth ratio for calculation of stairs? How to design a stair in slope slab? How to determine waise slab thickness of stair? Can an open well staircase landing beam suspended as cantilever? How to calculate average slab thikness of stair? How to staircase slap thickness? What is effective end restaint in stairs? What is the waist in stairs? What is pockets and dowels being left in supporting beams to receive staircases? 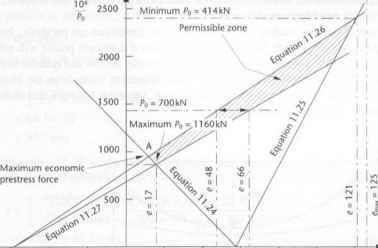 How to calculate average depth in stair case analysis? What is waist slab thickness of stairs? How to calculate staircase load? How to design two way stair case eurocode? Is standard of staircase slab thickness? How to design structural design of stair case? What is waist on concrete stairs? How can design waist of stair? How thick should the waist of a staircase be? How to calculate the waist slab in staircase by thumb rule? How to give slab for staircase? How thick is a step eurocode?